You might have seen the display of London Underground roundels on Westbound platform of St James's Park Tube station (home of London Underground's headquarters). On Saturday, I was waiting at the station for a train home after spending some time at Tokyo Day (some pics of iDogs, mecharobots, emo teenagers & other stuff here). 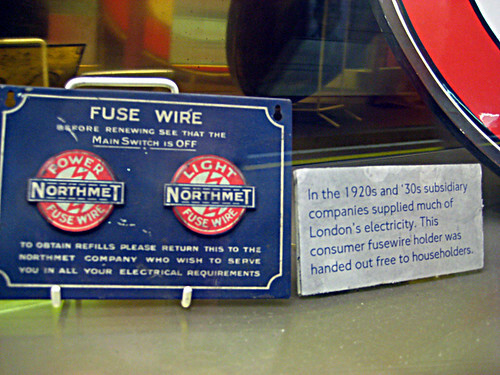 In the display there's some "roundel style" fuse wire holders, which were given out as freebies. This is pretty generous of an electricity company, as I can't see fuse wire being handed out today. But even if it was, I wouldn't have a clue what to do with it. I'm always slightly worried about the fuses in my house going, as I don't think I'd know how to change them. Thinking of fuses, reminded me that I'd seen a brilliant cartoon, taken by Andy Davison, which illustrates how Toprate Percy was used to teach drivers how to deal with defects (such as changing fuses) on the Tube. Andy kindly let me use the picture for the blog and said "I've been told that these were drawn by a manager called Alec Gorton a long while ago so would have been when 1938 stock was the conventional stock. Also Percy changes fuses without a fuse puller." The cartoon above, is only half of the story, so I'm not sure how Toprate Percy resolved the problem. There's another couple of cartoon from the series here. Do drivers, sorry train operators, have to change fuses on the trains now, or are there engineers and other people to deal with that? I never hear of trains being pulled out of action because of fuses going!